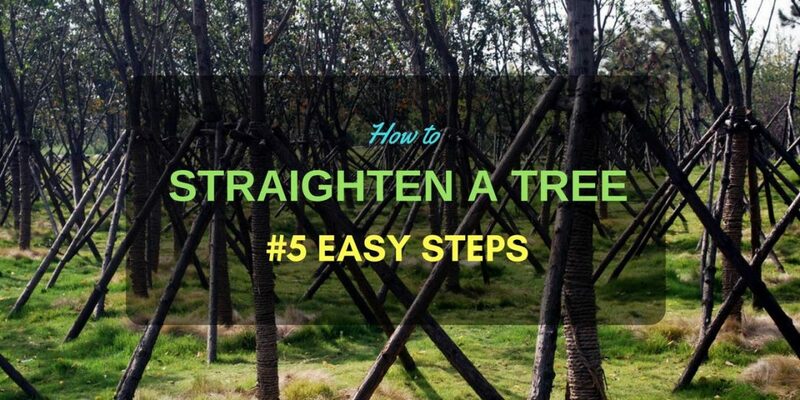 How to Straighten a Tree: 5 Simple and Easy Steps to Think on. It’s not at all hard to condition a tree to grow straight from the stage of being a sapling. But what about mature established trees? How to straighten a tree If it has grown crooked because of bad rooting or weather conditions? Additionally, you might wonder if you can still straighten a tree that is growing skew, or is it too late to redirect its growth? Fortunately, you can still help your tree grow straight even though it’s been bent over. You can also recondition your tree to grow straight despite its propensity to grow skew because of natural causes. Transplanting a tree for the sake of making it grow straight is risky, as upsetting the roots may cause the tree to die. There is a better way. This tutorial will give you steps on how to stop your tree from growing crooked, as well as how to manipulate its growth in a straight, upward direction. Moreover, you can perform these methods with any tree no matter how many branches it has. We’ll also explain what tools you’ll need to make these changes without damaging your tree in the process. first, though, we should understand why some trees end up growing crooked. Weather conditions: Consistent strong winds can bend your tree and condition it to grow at an angle. Uneven ground: Although trees can also grow crooked on flat ground, usually it is the uneven angle of the ground that affects the upward growth of your tree. Improper planting: Overly loose soil can affect the stability of your tree and cause it to lean over the older and larger it becomes. This is true whether a person hand-planted the tree or if it germinated naturally. Whatever the reason for your lopsided tree, fixing it is possible. Still, we can agree that understanding why the tree grows at an angle is vital to addressing the problem. When you understand the problem, you have a better idea of what is needed to fix it. Also, you’ll soon see why the following tools are recommended for straightening your tree. Get these objects together and let’s move on to a step-by-step tutorial on how to straighten a tree. No matter how established your tree may be, loosening the soil is an important first step to straightening it. Be very careful not to damage the roots when following these directions. Loosen the soil around the tree with the pickaxe and get the ground nice and soft. Use the garden fork and shovel to further loosen the soil. Try to go as deep as you can. This process may reveal a poorly planted tree if the soil has cavities here and there. Grab your stakes and place at least one beside the tree. Stabilize your stakes firmly into the ground using your rubber mallet. The distance between the stake and the tree depends on the thickness of the trunk. The thicker your tree’s trunk, the further away the stake should be placed. Here's a good example of a garden stake: 4-foot tall Bamboo Stake from Happy Hydro. Also remember that if the trunk is very thick, the stake must be longer so that it can help stout the tree higher up. This 6-foot tall hardwood stak﻿e may just be perfect for thicker or taller shrubs. Be extra sure you hammer your stakes into the ground as deep as possible. The deeper they go, the more effective they support process will be. With your stakes in place and your tree ready for straightening, it’s time to work on a straightening strap. This is super easy to make. Simply take your old garden hose and cut a piece to accommodate about a third of the circumference of the tree’s trunk (at the position you intend on placing the cable ties or heavy-duty garden ﻿﻿twine). Feed the cable tie or garden twine through the hose piece and make a slit in the center of the hose—being careful not to cut the cable. You can now place your custom made tree-straightening strap around the tree trunk and connect it to the stake. The hose piece will prevent the cable from damaging the trunk and the slit will ensure a tight pull. Connect the other side of the cable to the stake. If you feel it’s necessary, hammer more stakes into the ground for extra support in the same direction. If your tree has been leaning because of weather damage, chances are there will be some branches that need support too. Use your stretch tie (you can these great thick stretch tie tape here) take to position these straighter by tightening them to the trunk of the tree. The stretch tape will expand just enough for the branches to avoid getting damaged as they grow and develop. Now that your tree is positioned the way you want it, it’s time to firm up the soil again. If you find that there wasn’t enough soil when you loosened up the base, add more of that nutrient-rich soil and pack it down to ensure a solid foundation for your tree. Failure to do this will only cause your tree to lean again later on. Monitoring and maintaining your straightened tree is an important part of ensuring that it stays upright. Check on the tree daily to make sure the cable hasn’t gone slack. If it has, tighten it again. You may have to keep doing this as the days go by and the tree starts to grow straight on its own. Keep checking your soil too to determine that it's compact & firm. Keep this support system in place for a few months and try to avoid the temptation of remove it. Before long, your tree will be reconditioned to grow straight without any help.